If you prefer having quick access to the outdoors and indoors, consider the right patio door. Patio doors should provide a stable, insulated separation between your cozy interior and the weather outside. Furthermore, this type of door lets you welcome fresh air into your home. Renewal by Andersen® patio doors offer these functions. They also come in many styles to match your home’s architecture. If you are looking for charming St. Louis French doors, Renewal by Andersen has you covered. Our French hinged, swing, and sliding doors have a board stile and rail construction combined with traditional mortise- and-tenon joints. Choose from elegant oak, maple, pine, or prefinished white interior. Blend your home’s personality and your door with our multiple grille options. Frenchwood® Hinged and Outswing patio doors – Compared with other styles of patio doors, French hinged and outswing doors are a classic. You can install hinged patio doors into most openings, even if you currently have a gliding patio door. To save interior space, choose outswing doors. Both of these styles feature a glass fiber reinforced composite exterior for a lasting appeal with minimal maintenance. Frenchwood® Gliding patio door – If you love a French door design but prefer a sliding format, this is the right type for you. The door slides open on track rollers to save space. For an enhanced appearance requiring minimal maintenance, we incorporated it with a rigid vinyl sheath. It also has a reach-out lock system for added security. If you want a sleek addition to your home, choose from these two styles of patio doors in St. Louis. They feature thin frames for an unobstructed view of the outdoors. The doors slide smoothly on dual ball bearing rollers with independent leveling adjusters. For energy efficiency, they use our exclusive High-Performance™ Low-E4® glass. Both also have a reliable reach-out lock system. Perma-Shield® gliding patio doors – Strong and elegant vinyl sheath covers the strong wood panels and frame of this door. Andersen® Narroline® gliding patio doors – These doors feature a natural pine interior with mortise- and-tenon joints. A urethane base finish coats the exterior wood for long-lasting protection and weather resistance. 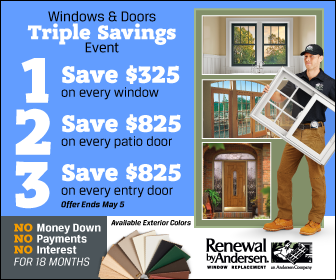 At Renewal by Andersen of St. Louis, we have design consultants to help you choose the right patio door style. Call us at (314) 332-2364 for more information. You can also request for a free estimate.